The Star Chaser tank knits up in our gypsy inspired Stargazer Silk yarn. This yarn is painstakingly hand dyed and then beaded with silver colored brass sequins. 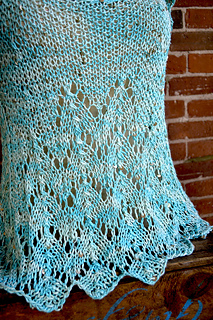 Stargazer is perfect for open, drapey sumer knits. The tank bodice is knit in a loose seed stitch while the body is knit in a scalloped lace stitch. Our favorite detail is the little petal-like cap sleeves that hang over your shoulders. 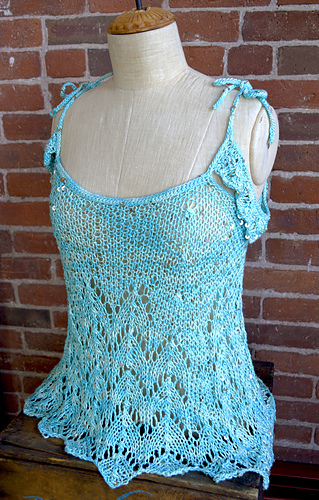 In this pattern, the tank is knit from the bottom up and finished with a crochet yoke and straps that give a supportive framework to the loose, drapey quality of the body. Size: The open stitch and loose silhouette make this style an easy one size fits most! This tank is meant to be loose and drapey. The knitted fabric is very stretchy due to the loose knit gauge. The crochet straps tie at the shouder making the length easily adjustable too.